Hi my name is Anthony Pellegrino and I live in Toms River New Jersey, for 20 years. Ten years ago my neighbor put an addition on his home and excavated the property. Ever since this was done and everytime it rain hard ,water came up through my ground in my basement. I lost the rug and I had to hire a company to come out clean up the mess and dry everything up. I thought it was just a fluke and I put down another rug, bad move because now every time it rains hard water was coming up through the ground into my basement. I lost another rug and after that I said no more rugs, I put up with this for a couple of years praying that it would never rain hard, and spent a lot of nights staying up all night pumping out water and cleaning up the basement, then a miracle happened I read about quality 1st basement, and I contacted a specialist his name was Maurice Robinson, Maurice came to my home and was a gentleman he explained every detail and was very polite. Told me what his crew would do and how they would clean up when they are done. I decided to hire them to waterproof my basement, and Maurice was right his crew was very professional and very polite, these guys worked hard and they work to the job was done, and they cleaned up everything not a piece of dirt was left when they were gone. That was a year ago, I can't tell you as a homeowner how happy I am to have hired quality 1st basement to waterproof my home, I haven't had a drop of water since the system was put in... I am happy to know Maurice Robinson and thank them for what they did they have save me endless nights of staying up all night pumping out water cleaning up dirt. I want to thank Maurice and his crew for doing a great job. And I mean that people please if you have any kind of water issues coming into your home contact quality 1st basement ask for Maurice Robinson he will hook you up and he will get your home back to being dry free. I want to say again thank you to Maurice Robinson and quality 1st basement I recommend them to anyone. We had been waiting a few months before fixing our problem. Quality 1st came recommended by my sister who is hard to please. Waterproofing specialist Brandon Byron provided and excellent presentation. The installation was excellent and we are very satisfied with the job. We found Quality 1st Basement Systems through an internet search. Recently, we've seen them in print ads, too. We are very satisfied with the job they did. The office staff was attentive, the saleman was excellent, and the installation team was efficient. My basement is now dry and they left the basement very clean. Meet Esau our Waterproofing Foreman! He is responsible for making sure your installation is completed correctly and on time. Esau and his crew are trained professional with many years of experience and training. Before his team begins the installation, he will do a full walk through with you. Half way through the installation, Esau will update you on the progress. Once the he and his team have finished the installation, he will explain how the system works, answer any additional questions you may have and begin cleaning up the space, leaving it cleaner then when they arrived. Check out this review from Daniel S.! This crawl space had moisture and high humidity which brought great concern to the homeowner. Quality 1st Basement Systems installed CleanSpace and Drainage Matting, two products that work together to keep the crawl space clean and dry by directing any water leaks straight to the sump pump system. CleanSpace provides protection against water, dirt, pests, and water vapor while the Drainage Matting will prevent water from getting trapped underneath the durable liner. 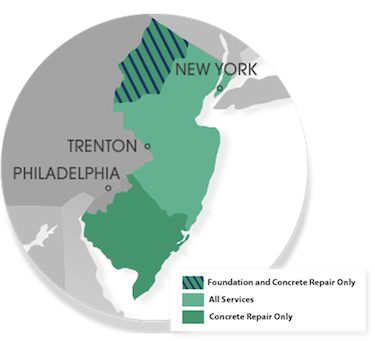 A homeowner in Plumsted Township, New Jersey was experiencing water coming into their basement during heavy rains and contacted Quality 1st for a solution. Our System Design Specialist inspected the basement and suggested that the basement is waterproofed. WaterGuard was installed along the perimeter of the basement underneath the floor slab, on top of the foundation footing to keep the system out of the mud zone. This will prevent clogging and the system will direct the water that seeps in through the basement walls to the sump pump. This basement is waterproofed so the homeowners can use it for whatever they want. Quality 1st Basements provided this homeowner with a permanent solution for the foundation issues they were experiencing. The interior foundation walls were bowing inward and large horizontal cracks began to form in the block foundation. They noticed that windows and certain doors in the house were being to stick and that the floors became uneven. Overall they had great concerns about the stability of their foundation. Luckily a friend had used Quality 1st Basements for a similar foundation concern and recommended the foundation specialists. Our team installed our CarbonArmor Wall Reinforcing System to stabilize the wall and begin to pull the interior wall back towards it original position. Each CarbonArmor strap is installed with a strong apoxy resin and then secured with a heavy duty steel bracket. For additional support, our team installed 7 PowerBrace beams to stop further damage to the wall all while preventing future bowing and titling. A concrete crawl space is certainly better than a dirt one, but it still isn't fully isolated from the earth. By installing a CleanSpace liner in this homeowners crawl space, we were able to ensure that any organic materials from the earth (including moisture) that could cause the home to rot were no longer able to get in. A homeowner in Plainsboro, NJ was looking to have their crawl space encapsulated to improve the air quality in their home and eliminate mold growth and moisture. Our team installed the CleanSpace encapsulation system to isolate the house from the earth. Now that the home is isolated, the homeowner no longer has to worry about organic materials rotting, mold growth, or any deterioration occurring in their crawl space. This Hightstown crawl space was damp, dirty and contained a lot of moisture. The homeowner was concerned with the air quality and was interested in crawl space encapsulation so they called Quality 1st Basement Systems. The Q1 team installed a CleanSpace liner to seal off and protect the crawl space as well as the foundation of the home. This creates a waterproof, dirt proof and moisture resistant area underneath the home. A SaniDry Dehumidifier now allows proper circulation of dry air and a TripleSafe Sump Pump will keep the crawl space dry. A homeowner in Lebanon, New Jersey wanted their sump pump replaced and contacted Quality 1st for a free estimate. Our System Design Specialist inspected the basement and noticed the old sump pump which was outdated. The TripleSafe sump pump was installed to replace the old sump pump. The TripleSafe has three levels of pumps built in to ensure the basement stays dry and healthy. In case of one pump failure the next lower level pumps will kick in. The TripleSafe is the best sump pump that will keep the basement dry. Quality 1st Basement Systems installed a crawl space encapsulation system in this Beach Haven, NJ shore home. CleanSpace vapor barrier will keep moisture out of the crawl space! A new homeowner in Ocean County, NJ needed their musty, dirt crawl space repaired. Quality 1st Basement Systems installed CleanSpace vapor barrier to prevent moisture from coming into the crawl space. The puncture-resistant vapor barrier also lowers the crawl space's relative humidity. After water flooded a basement damaging the lower half of every wall, Quality 1st Basements removed and replaced it with EverLast Wall Restoration. EverLast Wall Panels are mold proof and waterproof! 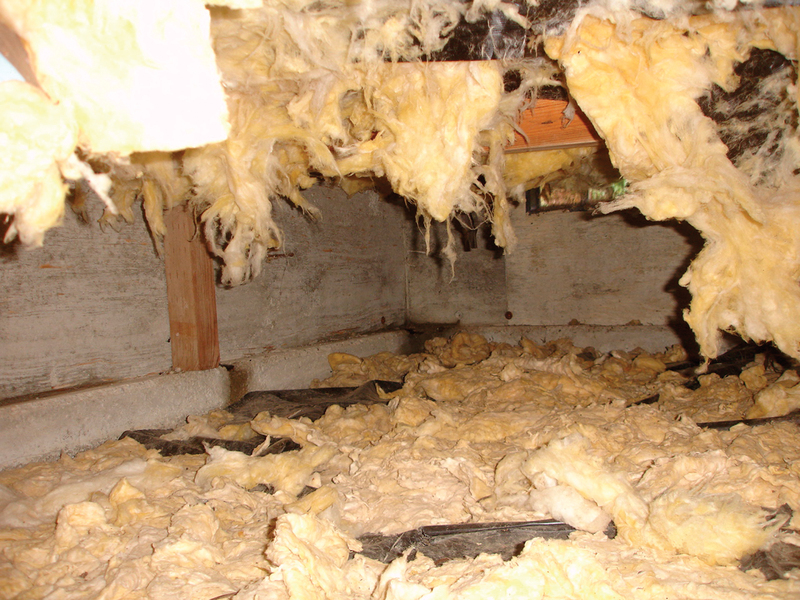 They have built in insulation to create a more comfortable environment in the basement. Quality 1st Basement Systems installed a long-lasting crawl space access well in this Toms River, New Jersey home. It provides an easy entrance to the crawl space, but also keeps out critters, moisture and dirt. The Turtl access well is available in three colors. Quality 1st Basement Systems replaced this old basement window in Toms River, NJ. The flat window lid looks modern and keeps out debris. Quality 1st Basement Systems replaced this sump pump with a TripleSafe. The TripleSafe sump pump has three pumps and a battery back-up for extra protection. This Toms River basement is safe with a state-of-the-art waterproofing system. After experiencing water in their crawl space, this homeowner contacted Quality 1st Basements for a solution. Ken P., a Senior Design Specialist, went out to the home and inspected the crawl space. He proposed a solution to the homeowner involving the installation of: CleanSpace Vapor Barrier, SilverGlo Insulation, Drainage Matting, A sump Pump & WaterGuard. The homeowner no longer has to worry about water in their crawl space even during heavy rains. Quality 1st Basement Systems installed SmartJack support jacks to prevent these crawl space beams from sagging. Now this Englishtown, NJ crawl space is supported and stable! This musty sump pump in Freehold, NJ needed to be replaced. Quality 1st Basement Systems installed a TripleSafe sump pump. The TripleSafe has an airtight lid to keep musty odors out of the basement! This Farmingdale, NJ crawl space flooded after heavy ran which created a wet and damp environment. The homeowner noticed moisture and high humidity so they contacted Quality 1st Basement Systems. System Design Specialist, Mike Jersey, recommended a full Vapor Barrier System consisting of a SmartSump Pump System, Drainage Matting, CleanSpace, SilverGlo, and Vent Covers. The Vapor Barrier System will prevent water, humidity and moisture inside the crawl space while keeping it dry and the air quality high. The difference is clear. CleanSpace vapor barrier transformed this crawl space! The vapor barrier keeps moisture out of the crawl space and lowers the humidity. With a 25 year warranty, there is no worry about the barrier ripping or tearing. Now this Ocean County crawl space is safe and healthy. Quality 1st Basement Systems installed CleanSpace vapor barrier in this Morganville crawl space to keep humidity low and moisture out. Quality 1st Basement Systems installed EverLast basement wall panels in this Middlesex county home. EverLast basement walls look great and also help waterproof the room. It is a beautiful and long-lasting solution! We installed EverLast Basement Wall Panels and ThermalDry Flooring for this beautiful basement in Edison, NJ.The EverLast Basement Wall Panels have built-in insulation and are mold and moisture resistant. The ThermalDry Flooring is great for the basement because it can easily be removed and replaced. Each interlocking piece has pegs underneath so that the carpet does not lay directly on the cold concrete floor. The flooring is waterproof and mold resistant so unlike regular carpet that would have to be ripped up and thrown away, the ThermalDry flooring will be protected. Quality 1st Basement Systems replaced this basement window well with a state-of-the-art SunHouse window well. The SunHouse window well keeps cold air out of the basement and looks beautiful in this Old Bridge, NJ home. Now plenty of refreshing, natural sunlight comes into the basement.